Instead of a bouquet of flowers for Valentine’s Day, consider giving just one dramatic bloom. Sometimes, simple is best when it comes to showing your love for another. You can offer your purest desire or adoration for a beloved, or a special person in your life, with a single beautiful token of affection and enjoy a good probability that your gift will be well accepted. The following flowers look stunning when given in solo form, so consider these. You can offer these blossom on their own, tied with a ribbon around the stem, or wrapped in pretty paper. The lily is perfect for giving alone because it grows on a long and elegant stem that can be handed to someone as is or decorated in a fun way. Lilies are narrow flowers that make a stunning focal point of your love, and they offer a dramatic display of a lone bud that opens slightly and widely to show off a gorgeous six-pointed trumpet shape. *Note that lilies are poisonous to cats, so keep this in mind if your recipient has these furry friends living at home. Of course we have to include the rose when we talk about single flowers that can be given instead of multi-flower arrangements. The long-stem rose, presented on its own, is a universal symbol of love. It’s a perfect expression of deep and passionate love when it comes in dark red, but you can also give a solo white, pink, or yellow rose (or any color of rose) for Valentine’s Day and show your love in a special way. 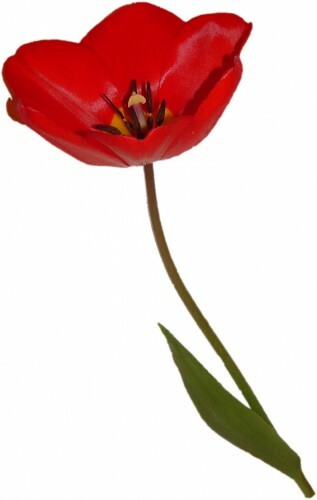 A lone tulip, in a shade of yellow, pink, orange, purple, or white, can be an ideal flower to give for Valentine’s Day. Tulips are versatile flowers because they can speak of true and passionate love, and they can offer a love of purity or of family. Tulips, like the other flowers on our list, have long stems that are great for tying with a bow or wrapping in lovely adornments. Have you ever given a single flower to someone for Valentine’s Day? If so, what did you give and how did your recipient display it? We’d love to hear from you in the comments below! Instead of a bouquet of flowers for Valentine’s Day, consider giving just one dramatic bloom. Sometimes, simple is best when it comes to showing your love for another. You can offer your purest desire or adoration for a beloved, or a special person in your life, with a single beautiful token of affection and enjoy a good probability that your gift will be well accepted.The following flowers look stunning when given in solo form, so consider these. You can offer these blossom on their own, tied with a ribbon around the stem, or wrapped in pretty paper.